Felt – You can find this at dollar stores and craft stores, they generally have a lot of different colours. There is acrylic felt (which is generally cheaper) and wool felt (which can be more expensive, and you’re less likely to find this at dollar stores). Thread – Matching the colour of your felt or a contrasting colour. Decorations – Ribbons, little gems/rhinestones, beads, little fake silk flowers, etc. What I did first was trace around my doll’s foot. It’s okay if it’s not entirely even because it’s just a rough trace, you can even out the lines and such after. Once you’ve traced it, you’ll want to make sure your lines are even and that the slipper base is symmetrical (so you won’t have to have a left and a right slipper). I drew lines to see where the edges around my doll’s foot was and then added some more to it at all sides so there’d be extra fabric needed (or else the slipper wasn’t about to get on. 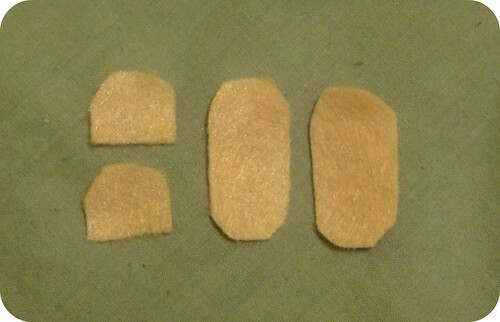 The two paper pieces I used for cutting out my felt pieces. You’ll want to cut out 2 of the half-slipper pieces and 2 of the slipper base pieces. If you trace the completed slipper base again, put your doll’s foot on top of it and figure out where you want the top of the slipper to go. Draw a line and when you’re happy with that, cut out that piece as well. 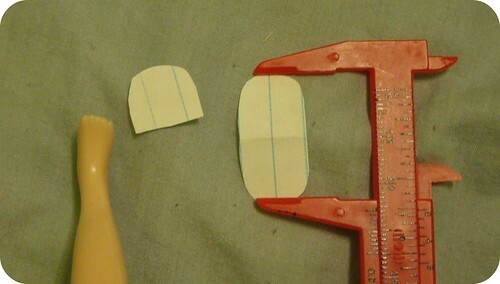 You can either pin the paper pieces to the felt or hold it in place when you cut. You’ll want to cut 2 slipper bases and 2 slipper tops. My felt pieces: 2 slipper bases and 2 slipper tops! If you’re going to add decorations to the top of the slippers, now would be a good time to do it. Try your best to put the decorations on at the same spot on both pieces. Once that’s done, you’ll want to match up the pieces to each other and then sew it together. I used a straight stitch, which is simply going in and out of the felt. You can experiment with different types of stitches for a different look. 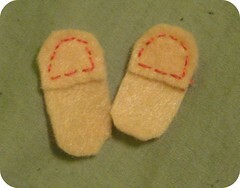 And there you have it, one pair of completed felt slippers for your doll that you made yourself! 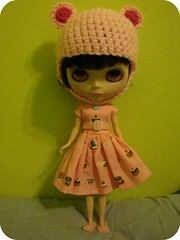 You can make a pair of each of your dolls or perhaps even make them slippers that will match their favourite pajamas? Be sure to share photos of the slippers you’ve made! What a terrific tutorial! Thanks so much for sharing this. These came out so much better than the slippers I once attempted! These r so so CUTE! Thankz for sharing this fab tutorial! Luv the cuteness of the slipperz! Fabulous idea…that never occured to me!